That banner above, "click book cover," appears atop every website page. It does not apply to this book. 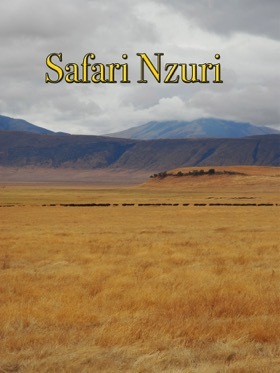 Safari Nzuri is not yet published. Four Brits, a woman from Florida, and their guide, drive "brass era" automobiles into the wilds of Tanganyika for a classic safari. It is a compelling journey of escape, renewal, and spiritual growth, composed in a novel, travel-journal-guide-book-language-primer. Status of the manuscript: May, 2016 - S. N. has now been looked at by a massively expensive London based book editor and we are still considering a 2017 publication (depending upon the economy). We are still debating entering the Kindle Scout contest. Advanced Reader Copies are available upon request (free PDF, or $20. Lulu print plus postage).